We’re delighted to be working as Creative Organisers on developing the inaugural Wye Valley River Festival, to be held in Spring 2014. The Wye Valley Preservation Trust and the Wye Valley Area of Outstanding Natural Beauty unit are planning three weeks of arts and heritage events that will flow down the river from Hay-on-Wye to Chepstow. Watch this space for information and updates. 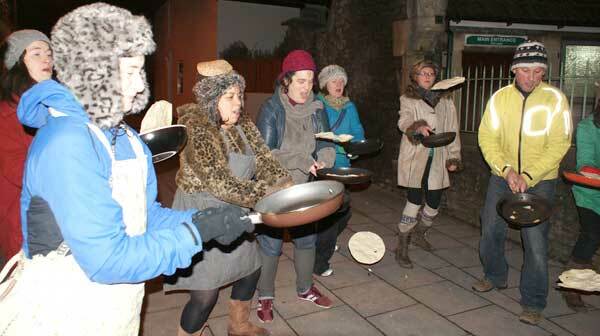 February 12 saw the annual festival of batter, flip and anarchy that is the GREAT EASTON PANCAKE RACE. This year, the Russian theme combined with suitably Siberian weather and everyone turned up in furry hats, thoroughly wrapped up in shawls. A very brisk series of poppadum tossing, freestyle pancake flipping and of course several glorious heats of pancake racing culminated in Jake ‘Le Snail’ Sportiello being crowned winner of the Golden Pan. On February 18 we dug a mighty big hole in the ground at Frome Vale Academy to launch their English Heritage ‘Heritage Schools’ programme. Our four archaeologists helped children discover items and objects linking to local history, transforming the school into a fantastical dig site for the day: “A brilliant Wow!” (Ros Farrell, Head of Frome Vale Academy).